A real-life romance between an Englishman and an American woman inspired Lavender Days. 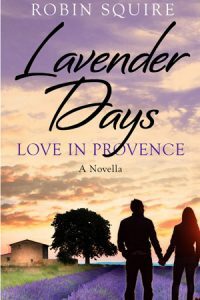 Robin Squire set his novella in Provence, with the heady aroma of lavender in the summer air. The story of Lavender Days hinges on a section of diary rediscovered in a dusty attic after 20 years. Incredibly, some stalks of lavender found with this little record of events still retain their fragrance after two decades, aromatically evoking those dazzling days. But why had the Englishman completely blotted these musty handwritten pages, and the little bag of memorabilia from his mind? Perhaps not for the reasons that might be assumed. Before your arrival I wasn’t quite sure what to do with you …and now I don’t know what to do without you. Rob explains: “Back in 1993 I hopped on a coach from London to Avignon in the south of France, for what amounted to a blind date with Kathryn, an American lady. She had read an article I had written about my negative experiences with dating agencies in England, and had responded via the magazine which had published it. We enjoyed a magical, unforgettable two weeks together, in and around the beautiful village of Jonquerettes in Provence’s lavender country.